I would like to share with you an over view of this still life painting. 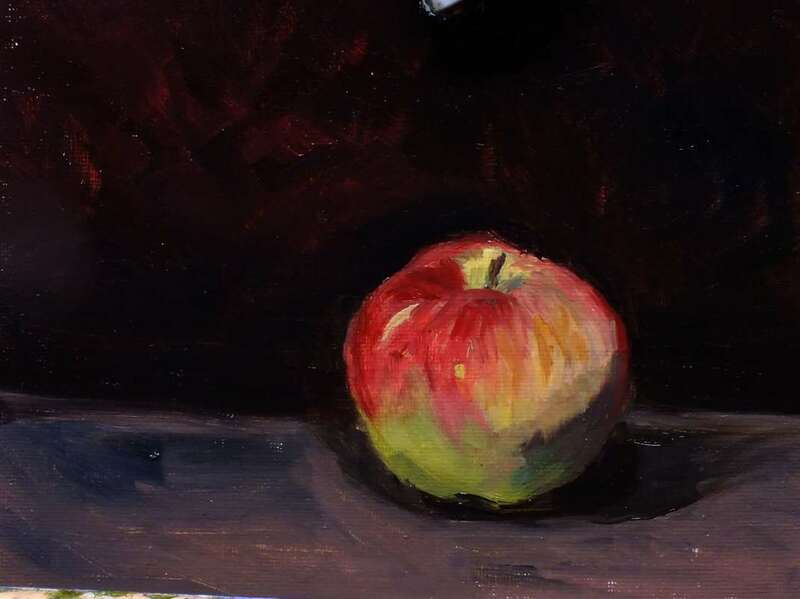 I always found still life painting as the best way to learn the various aspects of painting. Still life teaches you to see shapes and to observe with your naked eyes the subtle changes in colour and tone. These two are usually miss-represented in photography as the camera is not able to see what your eyes and brain can. It also teaches you about composition since a still life is not simply a collection of objects as in a bazaar store. From the technical perspective every object will have a different difficulty how to approach it and how to apply the paint onto the surface. For this painting I chose a highly reflective metal tea pot, a tea cup, tea bag and a pear to include some colour. The overall big shape of the composition running between the main objects is a triangular shape with the string coming of the tea bag and hanging off the edge creates a very gentle leading line to the main subjects. The objects are painted almost the same size as the real objects and are partly touching or coming off the edges of the canvas. I did this specifically to make the viewer feel like being part of the painting. This is an approach Caravaggio used in a number of his paintings. The green background is the complementary colour to the red design on the cup and the purplish tag of the teabag complements the yellowish colours of the pear. The colour palette is as follows cremnitz white, titanium white, ultramarine blue, pyrrole rubine, burnt sienna, burnt umber, yellow ochre, Indian yellow and cadmium lemon. 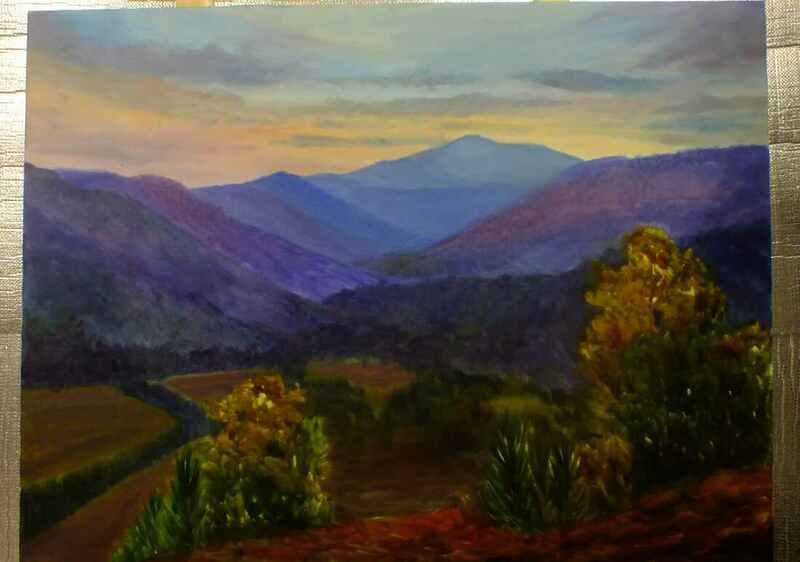 Paints are from Michael Harding, Blue Ridge, Old Holland, Gamblin and Williamsburg. Cold pressed linseed oil was used as medium added only in the second layer of paint. Most of this painting was painted "Alla Prima" with only slight adjustments of tone and addition of detail onto the initial layer. I always start from the darkest objects, so here I started from the teapot. Most people have the impression that metallic objects are very difficult to paint, I find it the opposite. The teapot was painted using chromatic black (a mix burnt umber and ultramarine blue) adjusting and lighting up the value to almost a mid value grey. The reflections are painted with a low chroma version of the colours used for the objects being reflected. The contrast between values gives the illusion that the painted object is metallic. Still life painting teaches you to observe chroma and makes you realise how low in chroma are real objects around us. 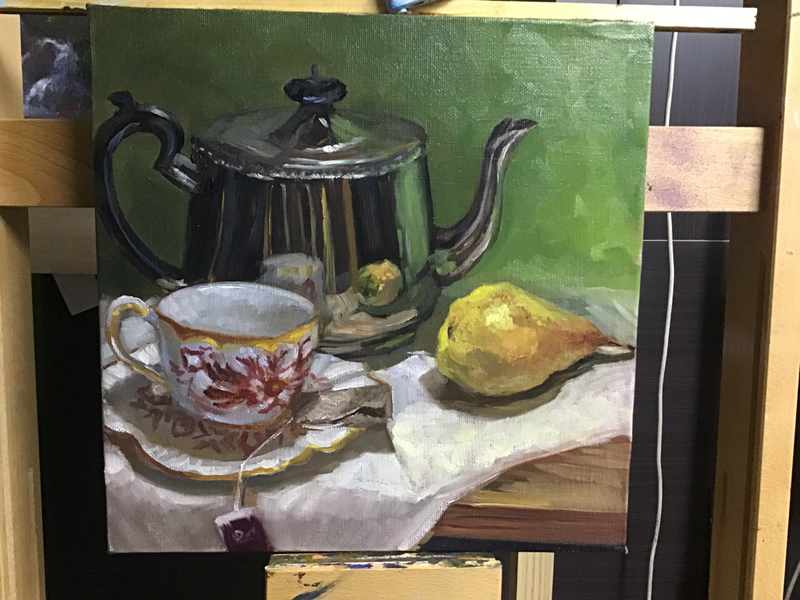 From painting the teapot I moved on to the background followed by the pear. 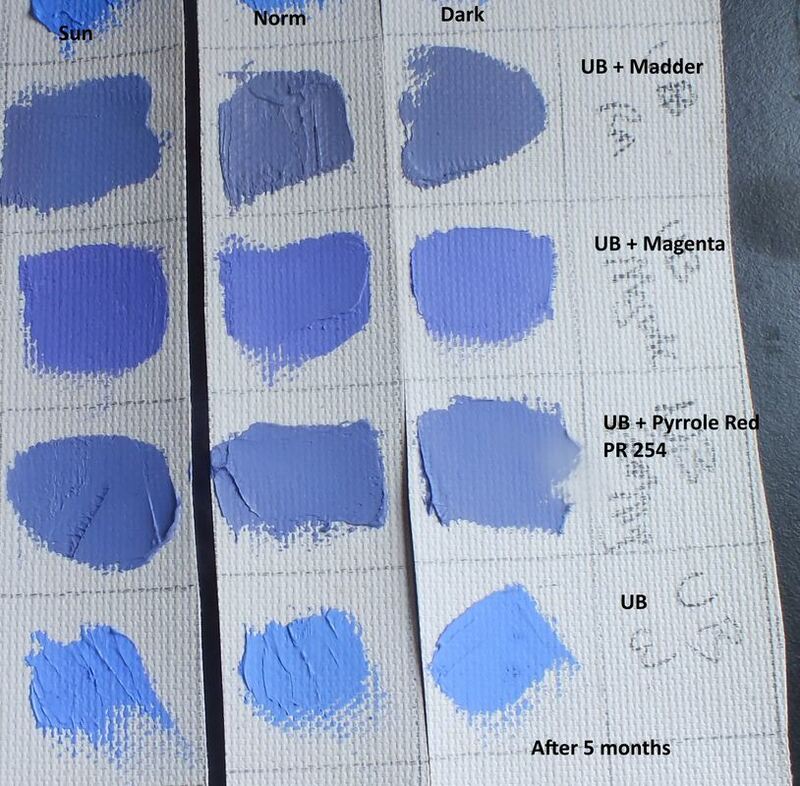 The most challenging were the tea cup and tea bag that mainly consist of high value blue tint mixed with umber. The golden colour is a mix of burnt sienna, umber and Indian yellow from dark to light value. Painting the pear was an interesting and fun part of the painting because one can observe all the effects of light on a single object starting from the reflective and shiny top part to the dark shadows and reflected light at the bottom coming from the background colours and the white cloth on the table. The short video demonstrated the application of paint while painting the tea cup. Hope you enjoy. Today I am sharing with you part of the painting process of a painting I am currently working on. 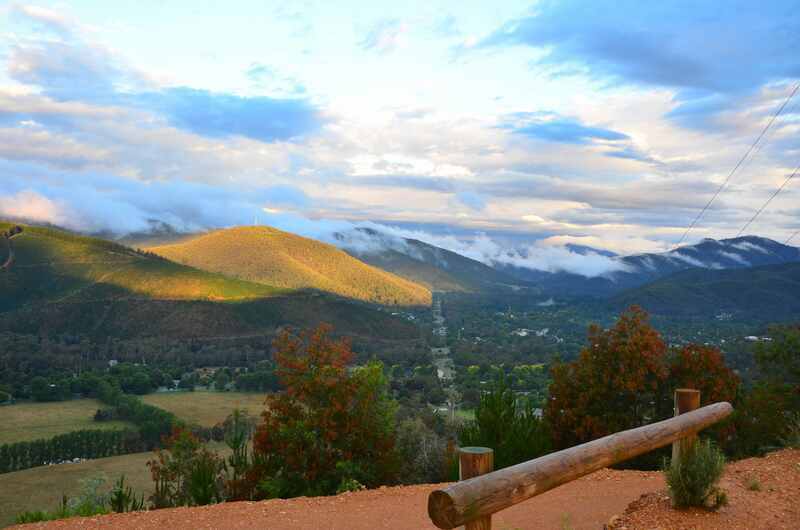 The scenery shows a view over the town of Bright in Victoria from Tower Hill Lookout. I visited this place couple of weeks ago at two different times of the day, at around sunset and mid-day. On my visits I prepared a plein air sketch and did a photo shoot of the whole scenery. Plein air sketching/painting is the best way of documenting the landscape as it gives you the capability to understand the landscape much better than taking photos, for the simple reason that you do observation from reality. Our eyes can see far more details than a camera could see. A camera is a machine and hence does not have a brain to created the illusion of reality. 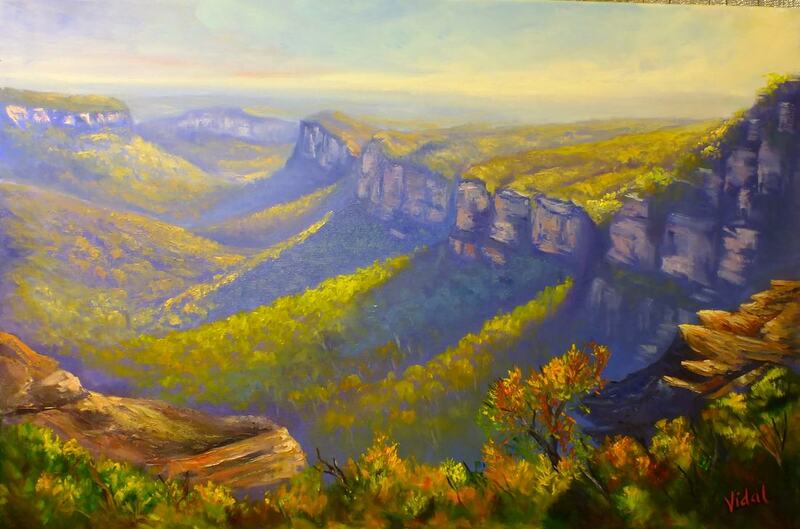 However its very difficult to capture the landscape at sunset and when the weather and light are constantly changing. So in that situation I preferred to use the camera to capture the light and my memory to record the atmosphere and the feel/smell of the air after the rain. This painting is a composite of three elements, plein air sketches, photography and memory. Its going to be painted on stretched linen 101 x 85 cm using oil paints. 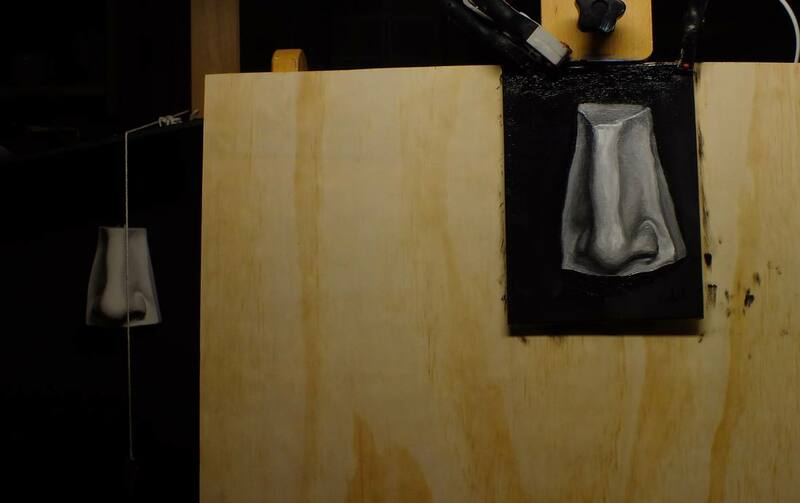 The first image above shows the first layer of paint (block in) where the main shapes and tones are established. Will keep you updated about the progress of this painting. 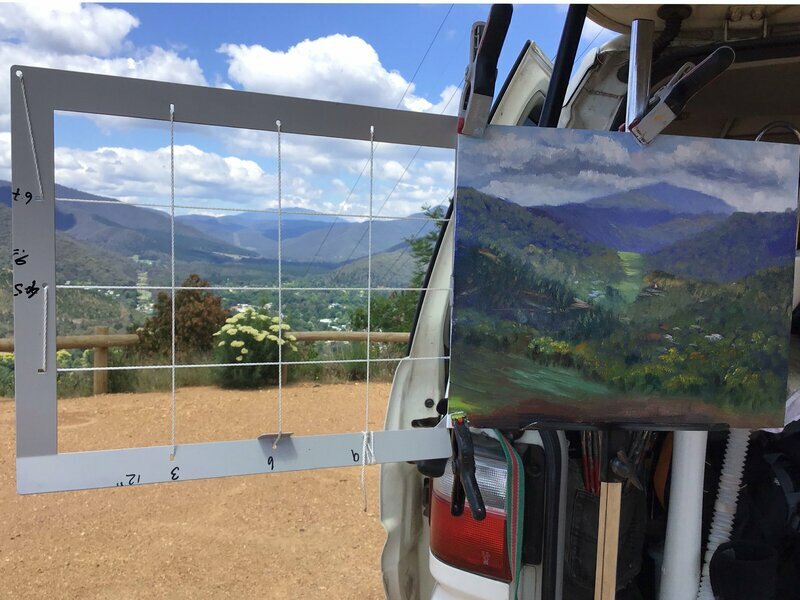 Painting outdoors is the best way not only to learn how to paint the landscape but also gives you the opportunity to experience being part of the same landscape. This experience will help you to understand better the subject matter that you are painting and to translate that onto the canvas. Apart from the visual senses one will also be translating the whole experience captured by the other senses, hearing the sounds of the birds, water, winds as well as feeling the heat or the cold air around that will affect the overall execution of your painting. I was camping around Lake Hume overnight and the next morning came out to be a very beautiful sunny and warm day. So while sitting there observing the view I observed a nice combination of shapes and complementary colour contrasts. So I took out my easel and paint box together with a small canvas panel. To help me construct the view I used a view finder same size as the canvas panel. I used a palette consisting of Ultramarine blue, phthalo blue, flake white replacement, permanent orange, cadmium lemon, Venetian red, ivory black, yellow ochre, Indian yellow, Pyrrole rubine and magenta. To help establish the light value of the lower part of the sky I used a colour checker. Working fast and from back to front I established the lightest and the darkest tones to start with, so that all the rest is in between. The end result is above. Happy with the outcome and the execution of this painting. Learning how to paint is much more than learning techniques. Although for a beginner learning techniques is essential, however it is also very important that one develops a keen eye for observation. This process will make you more aware of what is around you, that most of the time is ignored due to our busy and fast pace of life. Once you develop the habit to look at things in more detail you will start looking at the world from a different perspective and you will start seeing beauty in everything even the simplest objects. 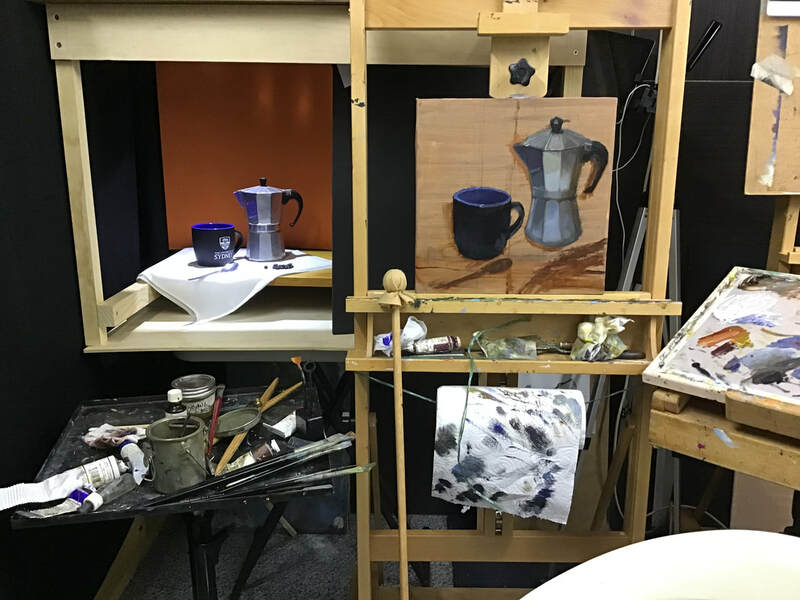 There are various methodologies used in art schools to improve the skill of seeing as well as other skills such as colour mixing, getting the right tone and improving brushwork. One of the approaches is to paint copies of master paintings. Obviously you need reliable sources as points of reference and hence the best options are museum works of art. Using these master pieces as references also avoid any issues related to copyright laws as long as the artist passed away more than 75 years ago. So I decided to paint a copy of a still life painting done by the Irish-American painter William Harnett entitled "Just Dessert", which was painted in 1891. 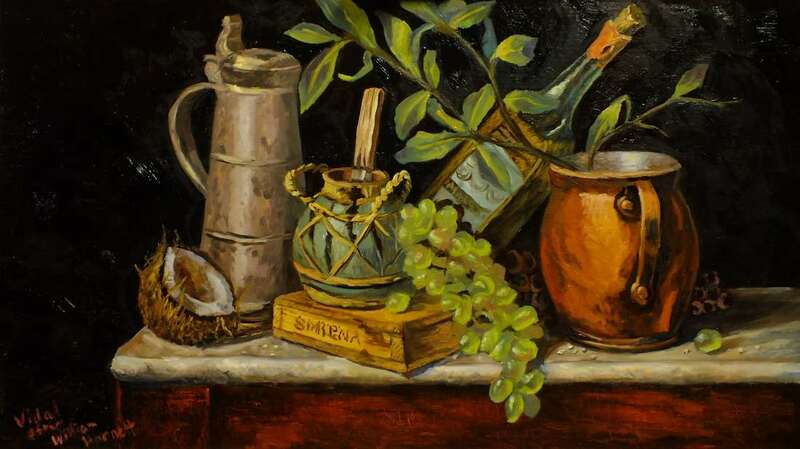 This painting is a complex still life where you have various objects and materials such as metal, wood, glass and fruits all on a table with a marble top. Each object will require a different technique in terms of brush strokes and application of paint in order to recreate the effect of light and texture of that particular material. For this study I used very fine Belgian linen (smooth surface) attached to board size 61 x 35 cm. Since the dimension of my canvas was different from those of the original painting (above left) I had to do some modifications to the proportions of the objects. Before starting drawing I prepared my surface by applying a very thin layer of burnt sienna diluted with 15% cold pressed linseed oil in odourless solvent. Using a rag I wiped off excess paint and left the surface to dry completely. As colour palette I used the following paints: Ultramarine blue, burnt umber (Michael Harding), permanent alizarin crimson, burnt sienna, flake white replacement (all from Gamblin), Naples yellow deep (Old Holland), Pyrrole red (Langridge) and cadmium yellow light (Masterclass). Since I knew that it could take me a week or more to finish this painting I wanted to avoid the need to re-prepare my paints on my palette. So on the first day I invested a significant amount of time preparing my paints on my palette and mixing them with a very slow drying medium that will keep your paints workable for more than a week on your palette. To do that I took out of each tube a significant amount of paint and mixed it with an amount of medium until the consistency of the paint was similar to that of mayonnaise. The slow drying medium consisted of the following components: odourless solvent, cold pressed linseed oil, stand linseed oil, walnut oil, clove oil and Venetian turpentine. If anyone is interested in the recipe please contact me. After I finished the drawing I started by blocking in the background with a very dark value mix of chromatic black consisting of burnt umber and ultramarine blue. The objects were tackled one by one starting from the darker ones in order to avoid using white paint too early in the painting. I was amazed how each subject presented a different challenge and the way how it had to be tackled was different from any other in the painting. While doing this painting I fully understood the capability of the artist and how wisely he chose the objects. The direction of the light was clearly from the left hand side probably coming from a window (there was no electricity at that time). There were some objects that initially I thought that they are going to give me a hard time to paint such as the marble table top but in fact they were quite easy while others that initially seemed to be easy but they were difficult such as the grapes and the wooden box in the centre. The grapes were the most complicated as they had all the effects of light on them. Painting these grapes was similar to painting a human eye, both being round fluid filled and translucent objects. The grapes had a cool bright highlight coming from the window light, followed by a dull internal shadow and a bright transmitted warm light on the opposite side of the highlight. Some grapes also had reflected light of a reddish colour coming from objects around them.The brightest values in the highlights of any object were not higher than mid-value on the palette and they only look so bright when seen in relation to the darker values around them in the painting. 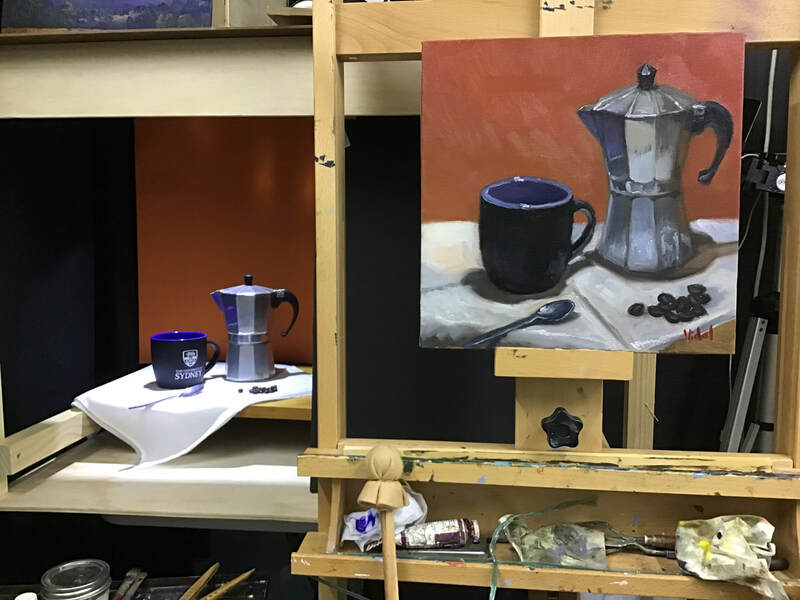 Although not easy, painting a mastercopy is slightly easier than working from a still life or in the case of portraiture it will be easier than working from the model. This is because the artist already did a lot of work translating the real colours into paint, something that you need to do yourself if you are painting from life. In the case of a landscape it is the same situation. Painting a copy of a landscape painting can help you understand colour as one can relate the paint to the colours used by the artist and you do not need to translate these yourself either from life or else if using a photo. However the knowledge acquired from doing these copies will help you to create your own paintings from any source of your choice.